I’m very picky when it comes to closet doors, I don’t really like any of the options out there. First you have the rolling closet doors that, always, cover half the closet half the time and are a bit of a nightmare to install, nope, hate em. Then you have the old fashioned kind of closet doors where its basically just two interior days side by side that open out, I like this idea but they’re usually really heavy. Bi-fold closet doors are probably my favorite kind (if I had the choice) but they’re also rather a pain to install and complicated to make. What all closet doors have in common is that they are all VERY expensive. I priced out bi-fold closet doors for this whole house a few months ago and it was just shy of $1,000! And that wasn’t even the real wood ones but the fake “wood looking” closet doors and that’s just outrageous to me, there is no way in heck I was going to pay that kind of money for closet doors. (When I mentioned it to Joe I believe his answer was “Why do I even need closet doors?” And, at that ridiculous price, the man had a point!) What I really don’t like about closet doors is just how substantial the doors are usually… It just seems odd to me. Will I be hiding in my closet someday and the strength of those doors the only thing that will save me from the zombie hoards? I really doubt it. It just seemed to me like there needed to be some kind of alternative, something that was light and so easy to use it never seemed to be in the way. SO (as you might imagine) I got to work! Then, I took my measurements. Take note: whenever you’re measuring for doors, give them some breathing room to swing about. Make sure you don’t build them so tall that they will ever catch on the floor etc. I took my measurements and my bundles of 2x2s to the garage and got to cutting. I built two sets of doors at once, one set for my entry/coat/shoe closet and one set for my laundry room closet. From there I laid them out on my flat garage floor and used it to help me keep the boards as level and straight as possible. Note: 2x2s WILL SPLIT! 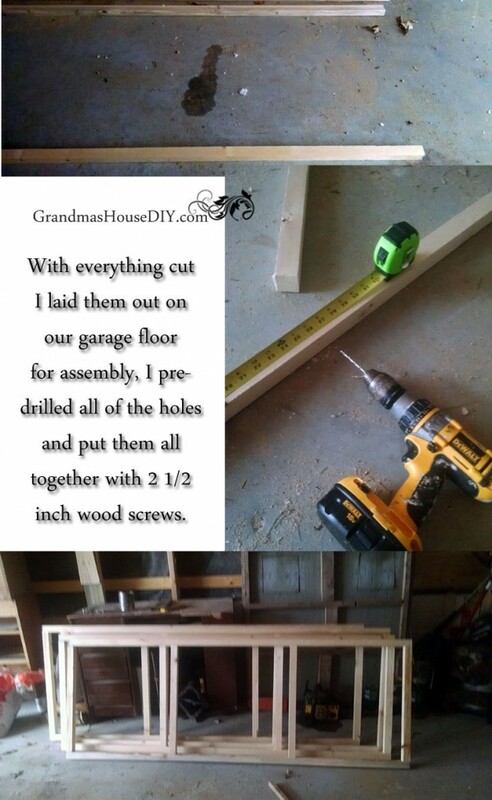 You must pre-drill all of your holes and yes this does double the amount of time but you have no choice. I designed them so the all four of the center slats would go inside of the two vertical slats. Remember when you measure the width of these four horizontal slats that you must account for the width of the 2x2s on either side of them. I decided to hang the doors immediately after assembly and before paint. No, I would not of done this normally but it is VERY winter here so I had to paint them inside regardless so, it was just easier to hang them and then paint them hanging. I just taped off the hinges. With the two coats of white paint dry I grabbed my stapler and started to hang the fabric. (I purchased two curtain sheers from amazon for only $6!) Now you can use absolutely any fabric you want here, you could even just tack plywood to the back of your frame too and paint it all any color you would like, or chicken wire for a country look, or screen for a screen door look! The options here are just limitless and I love that if I get sick of these sheers I can just rip them off and replace them with something new! And there you have it guys! All in, I spent less then $30 a set! I have a few more sets to build and I can’t wait because the closet doors are one of the last finishing touches I have to do in the whole house! So, instead of paying nearly $1,000 for all of my closet doors I’ll be paying less then $200! Thank you for stopping and sharing! These are great! I need some double closet doors and have been getting by with curtains (not my favorite thing to do). You are becoming my most favorite blogger. I THINK that our budgets might be about the same. Diana, they were SO simple to make! I’ll be making them for a few of the other closets in my house too, I love how there are so many options with them, I might have to try staining them next time! Thanks for coming by! You had me cracking up. Doors are outrageously priced these days. You had a clever solution, though. None of us really wants to look into closets. Even though we see all these beautifully organized closets on social media, the truth is, they seldom stay picture perfect. That’s just the nature of storage areas. This week I did a themed highlight post featuring all the door projects from Thursday Favorite Things Blog Hop and you are included in the features too. You are so talented Tarah! 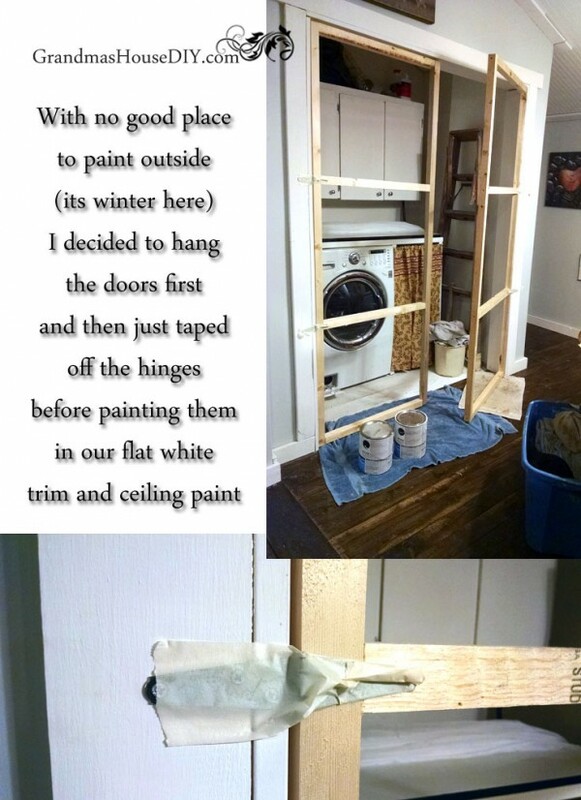 Making your own doors. If it were me they would be on a heap on the floor now. They really look great and the sheers add just the right touch. Pinning and sharing. I really like these! I need some on my closet! Thanks for sharing on the Pleasures of the NW’s DIY Party! 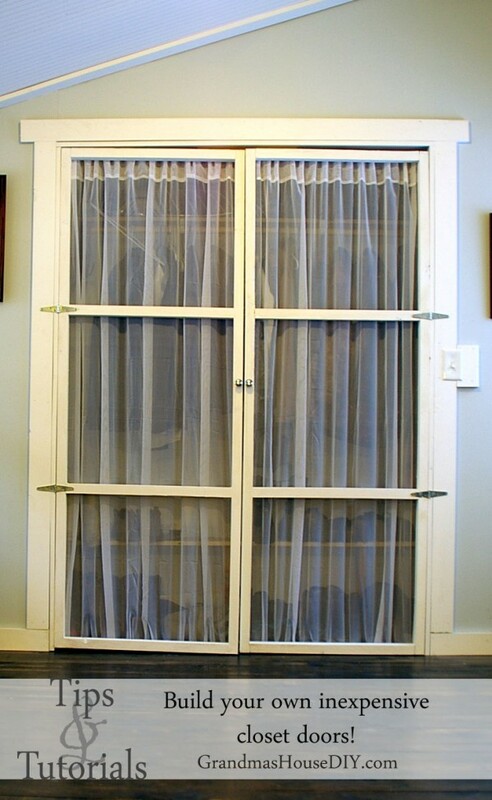 What great way to hide things without putting them behind regular doors. This idea will make a smaller room look bigger too! Thank you so much for linking at #overthemoon! I look forward to seeing what you share every week. Please come back for #WonderfulWednesday or #ThursdayFavoriteThings. Don’t forget to comment your link #’s so I can be sure to visit and you get a chance to be featured! Pinned and shared. Marilyn thank you so much for coming by and hosting such great parties! See you next time! The closet door struggle is real! You got it done well miss! Thank you so much Ashleigh!! What a great project and makes the room look so light and airy!! Great job and great instructions!! Thanks for sharing on My 2 Favorite Things on Thursday!! Pinned!! Thanks Carla! So far, we’re really happy with the doors, they’re so light! Great idea on the closet doors. I love how inexpensive they are. Thank you for sharing at Dishing it and Digging it link party. We love having you. You take on some big projects and they all turn out great! These look really nice! Kendall, that’s a great idea to convert rolling doors to hinged doors! I’m going to experiment with that too, though I love these doors I’ve also got other plans to see what else can be done inexpensively! Thanks for coming by! Hi Tarah! Loved what you created and had to share your ideas with A Little Bird Told Me Link Party readers. Keep up the great projects!!! Love how unique these closet doors are! Haven’t seen anything like them before! Thank you for sharing this Tarahlynn! I’m lucky enough to get double closet doors in my master bedroom, and have been considering switching my guest bedroom’s closet door to match. 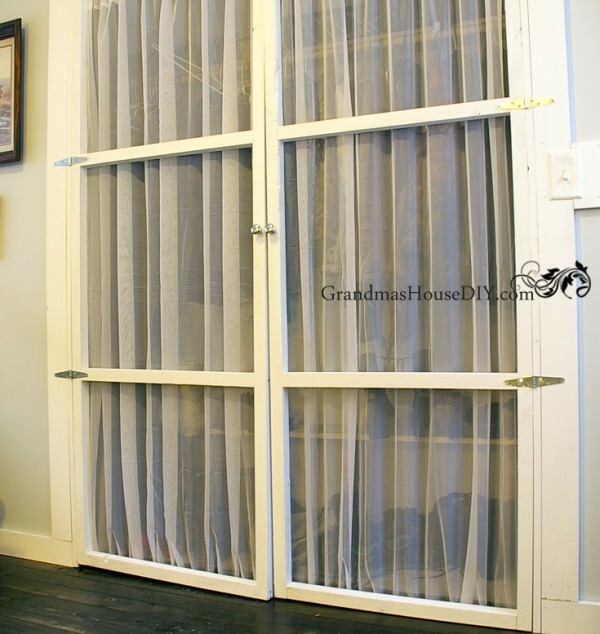 This is an efficient way to do it and I love the curtains too! Thanks so much for sharing this on #shinebloghop last week! I can’t believe how pretty they look. Very creative too. Saw your post at I am Pinnable #31. Thank you so much Grammy Dee! Your talent for DIY is incredible. These doors turned out very nicely. It will also be an easy change to update them with different light fabric. The cost of home decor and materials is so beyond ridiculous you should be proud for finding your own economical solution. Well done. Thank you so much Leanna! I have a couple more closets that need doors so I’m going to experiment with other ideas and fabrics! I love these closet doors Tarah – honestly can you come to my house and decorate !! This is awesome! Thanks for sharing at Sew It Cook It Craft It! What a great way to turn your laundry area into a beautiful space! It’s crazy how much you can save with some creativity when it comes to home projects. I love this idea! What a good job you did, too! Thanks for sharing! Visiting from Tune In Thursday. I love this idea, I wish I could have a laundry area like that. Thank you for joining The Really Crafty Link Party. Pinned! Have a great weekend Teresa, thanks for coming by! 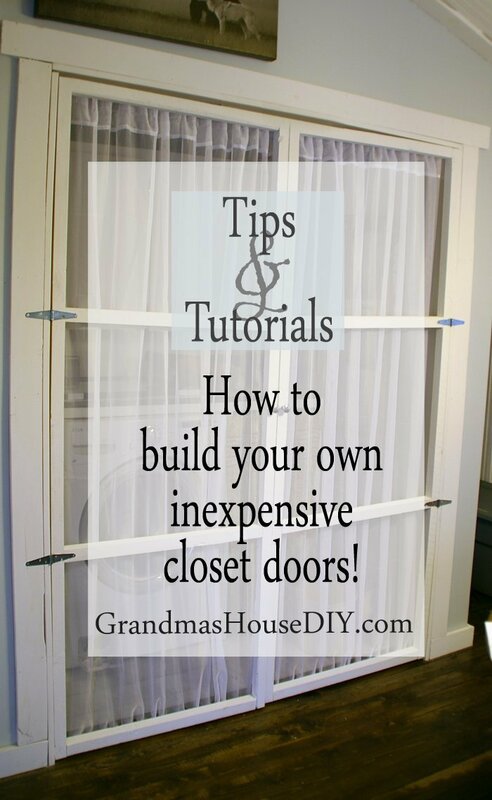 I love that you made exactly the kind of doors that YOU liked AND you saved money – I’m so jealous! 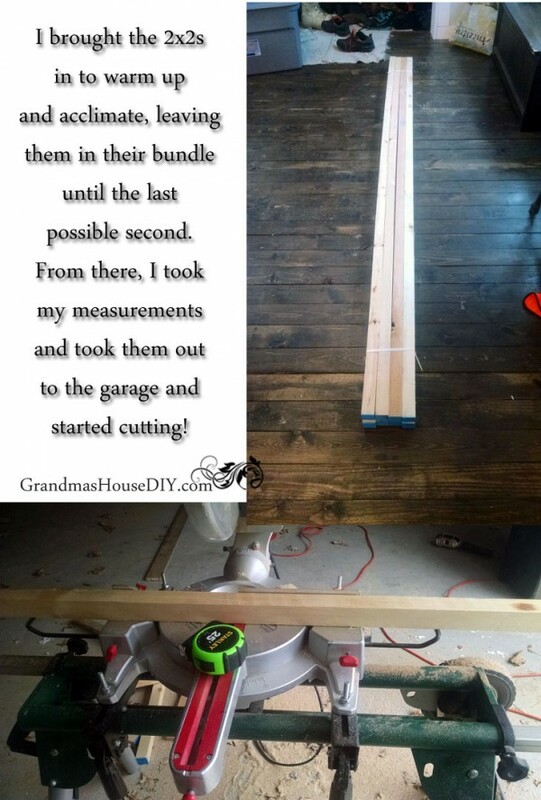 I can’t operate power tools, lol, but this is a great tutorial. Don’t think there is any ? how talented and innovative you are when it comes to a difficult situation. I so love those doors and the curtains, how you installed them, no rod required, what a smart gal you are, love to see that kind of initiative. it won’t work but I go ahead and do what makes sense to me,just go for it, what do you have to lose? Thanks JaneEllen, you sound like a lady right after my own heart!